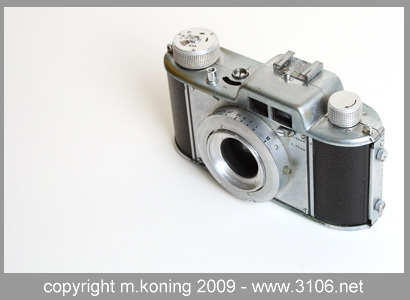 Nickel plated brass formed the basis of this beautifull designed camera. It looks very light weight, not only because of it's colour but also because of it's smooth curves. The AkArette has interchangeable bayonette mount lenses of different focal length. At the time of production reportedly high quality Schneider-Kreuznach 35, 50 and 75 mm lenses were available. The nickel plating does look nice and gives the camera a nice touch but it got easily rubbed off with normal use. So many cameras you will find used nowadays don't look so new anymore and often the brass shines through. 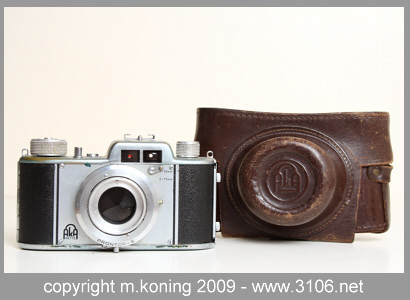 The camera mechanics and built however are of high quality and these 50 year old camera are often still working fine. The funny thing is there are two viewfinders, a feature I haven't seen before. Only one view finder at a time would be used. When the small lever below the window is set for 50mm, the view finder for 75mm would show a red signal and could not be used. When the lever would be set in the 75 position, the 50mm view finder was blocked. There is however no 35 mm viewfinder window so there might have been an (optional? )auxilary view finder for use with the 35 mm lens. The camera back may be opened by sliding the small button on the left hand side of the body downward. There are two such buttons but only the top one works. The hings is on the right hand side. The back may be opened even when the camera is connected to a tripod. The film counter does not have an automatic reset so you will have to reset the counter manually by turning the frilly-edged screw on top of the camera. My camera unfortunately came without a lens and separate lenses are hard to come by so I was never able to use it. Manual focusing through the focus ring. Viewfinder : Two small view finders, one for use with a 50 mm lens, the other for use with a 75 mm lens. Always one of the view finders is blocked. Flash : Cold shoe on top of the camera. Shutter release : A cable release may be screwed into the standard release cord socket. A full model list with all known AkA models listed. In German. The history of AkA Apparate und Kamerabau Gmbh 1946 - 1960. In German.